A petite shade creates a spotlight-inspired look for this contemporary LED floor lamp. Delivering energy-efficient LED lighting to any modern space, this contemporary floor lamp features a chic black finish for a non-nonsense approach. From the Quest collection, this lamp features a small shade with a stable round base and fabric-wrapped cord. Adjusts from 47" to 64 1/2" high. Shade is 3 1/2" high, 2 1/2" wide. Round base is 10" wide. Integrated 7 watt LED module. Light output comparable to a 40 watt incandescent bulb. 3000K color temperature; 80 CRI. 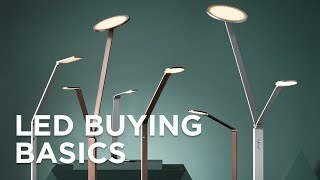 Energy-efficient contemporary adjustable energy-efficient LED floor lamp. Light output is 600 lumens. Part of the Quest collection by Adesso. BEST ANSWER: Hi, the touch dimmer is located on the vertical pole.